For almost 30 years, Sean McGuinness has led groups of players to places they thought they would never see and trophies they never imagined they would win. The Sarsfield’s clubman has been part of some memorable days – none more so than Down’s breakthrough Ulster Championship win in 1992 – but it began long before that. “It all began a long time ago with Sarsfield’s when I helped out with the 1974 team that won the Antrim Championship – the only one that we ever won,” he recalls. “Joe Duffy was the manager at the time and I learned a lot from Joe. The following year I took the team and we were beaten in the final, which I think was a bit of naivety on my part. The performances of the Sarsfield’s team did not go unnoticed and the next logical step was to assume the reins at county level. McGuinness took a young team of pretenders that had competed in the Leinster Minor Championship that in later years would become household names such as McFetridge, McNaughton, McCarry and the Donnellys. Those players went on to meet Tipperary in the All-Ireland final of 1989 but they announced their arrival in 1986 when McGuinness almost masterminded a semi-final victory over that year’s eventual champions Cork. The 7-11 to 1-24 defeat was played in front of a paltry attendance but those who were there witnessed the beginning of the golden years for Antrim. However, a question of conscience forced McGuinness to resign as Jim Nelson guided the Saffrons to a famous victory over Offaly in ’89 while the Sarsfield’s man plotted another hurling uprising. “I ended up resigning the Antrim job over a matter of principle but was then approached by Down to take over in 1989. That was the first year they played in an Ulster final but they weren’t ready,” said Sean. “It took a bit of work especially when there was nobody talking to one another. “Of the four walls in the dressing room, Portaferry were along one, Ballygalget along another and Ballycran the other with me sitting on my own along the fourth. “We had to get that out of their system and we managed to do that. I told them they would never win an Ulster Hurling Championship unless they were playing Division 1. McGuinness recalls his years spent guiding the Ardsmen as his favourite era in the game. While Antrim fans looked on in disgust as their former leader celebrated a landmark victory in the Ulster Final of ’92, McGuinness said he knew he was ruffling feathers but was delighted to be working with such a committed group of people. “The six years I had with Down were the best I ever had in hurling. They were great lads – they would have died for you. “We beat Antrim in 1992 and while I got a lot of abuse from the boys on the road it was only natural and I expected it. “One fella said to me ‘you and I are good friends but you are still a turncoat’ and I said ‘ you are 100 per cent right, I am’,” laughed McGuinness. What followed was a heroic performance against Cork in the semi-final as a Gerard McGrattan inspired Down fell short, losing by 2-17 to 1-11. While the players gave their all on the field, the backroom team and county officers such as Joe McCrickard, Donal McCormack and Kevin Bell were singled out for their commitment. While football dominates the sporting landscape in Down, McGuiness was impressed by how well the hurlers were treated and how everyone in the county rallied to the cause. “When we played Cork in the All-Ireland semi and lost by nine points, we went back up the road to the Carrickdale for dinner,” he added. “There were 600 people there. Unknown to us, they had organised a reception and the whole Down football team from 1960/61 was there. “What people didn’t realise was that even though they were football people they didn’t turn their noses up at hurling. “I always remember Sean O’Neill coming into the dressing room with his Down tracksuit on and a flag bigger than himself. Things were now looking up for McGuinness and Down. McGrattan became the county’s first hurling All-Star that year and in the following National League campaign they defeated the All-Ireland champions Kilkenny in Nowlan Park. This could not be achieved without the dedication of the players. Their commitment and talent was of the highest quality with players like Noel Sands, Gerard Coulter, Martin Mallon and Danny Hughes – a man that would come back into McGuinness’ hurling life at a later stage. “I think I got them at the right time. All they needed was a bit of guidance. I had a great time in the Ards and we went on to win another Ulster title in 1995,” said the former Ulster Inter-Provincial boss. “From then I went back to Sarsfield’s and then went up to Lavey (Derry) for the year. A Master Tutor’s course at the University of Limerick followed before a brief second stint in charge of the Antrim team in 1998 when a 2-18 to 2-9 All-Ireland quarter-final defeat to eventual champions Offaly ended their summer. 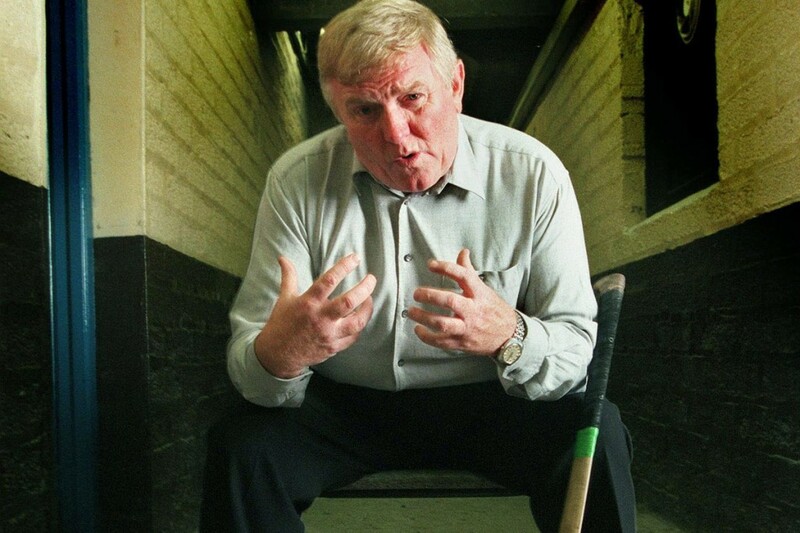 The West Belfast man then began to spread the hurling gospel and took coaching courses throughout the country before an approach by South Belfast club Bredagh was a challenge too good to turn down. “I coached all over Ireland and I don’t think I ever knocked a team back,” revealed Sean. “I think hurling people in general are like that. If you are asked to do a session in Monaghan the natural response was always to say yes. “Then four years ago Paul Blaney (then Bredagh chairman) approached me and asked would I take their senior hurling team. “When we met he brought Danny Hughes with him. Danny had just retired from playing and I said to him that I would take it if he would play for one more season. When appointed in 2007, the McGuinness duo took over a side that were competing in Division 1 in the Down Hurling League that consisted of the second tier Down clubs and the Ards ‘Big 3’ reserve teams. During their maiden season, earning a draw at home to one of the Ards clubs was seen as an insult and in the return game a full-strength Ards side was put out, which included up to six county players. Although they won the Down Junior title that year – this incident prompted the management team to seek for a move into the Antrim leagues, which was agreed by the club committee. The following year Bredgah competed in both Down Division 1 and Antrim 4B before dropping out of the Down hurling league – a move McGuinness feels was instrumental in their subsequent Down championship success. In 2010 Bredagh than claimed the Intermediate Championship – not bad for a club that only resurrected a hurling team in 2005. “Colm does all the hard work. We would have sat down at the start and talked about what we needed to do and drew up a plan because I’m a big believer that if you fail to prepare then you prepare to fail,” stated Sean. “After the first year we played in both Down and Antrim. We had to play 35 matches, which was murder, but we won 4B and the following year we dropped out of Down and won 4A. While a heavy defeat against Portaferry in the Down Senior Championship was expected, the quality of their performance was one pleasing aspect. Of more importance however was their campaign in Division 3 in Antrim. Maintaining their status was the primary objective and that win over Cloughmills confirmed their survival but also marked the final whistle on the career of one of Ulster hurling’s most well-known and colourful characters. “We got hammered into the ground in Portaferry because that was their first time playing senior championship and it was a learning experience but the players gave it everything on the day,” admitted the 66 year-old. “The following week we played Cloughmills where if we won we stayed up and if we lost we went down. “Next to the Intermediate Championship that was the best performance they ever produced. “After the match I told the boys I was finished. It was with regret I said that but it was time to go. “I have just got to the stage where I’m too old. I’m 66 and it’s not the day of the match. “Every week we are doing Tuesday, Thursday and Sunday morning training and I’m standing in the lashing rain wondering why I’m here. For Sean McGuinness, the future unsurprisingly involves attending hurling games even though he will be on the opposite side of the fence from where he has spent the majority of his life. He can now return to where it all began at his beloved Sarsfield’s and watch the next generation of players and managers evolve. During a lengthy career he has raised hopes and expectations – sometimes to unattainable and unrealistic levels. “I always remember playing Tipperary down in Ballycran and they scored with the last puck of he game to win,” he laughs. That was the magic of McGuinness. While Sean will never be far away from a dugout and will always be on hand to offer support and advice if asked, he has decided the time is right to call it quits. With his son Colm now destined to prowl the sidelines, the McGuinness hurling legacy has a few chapters left in it yet.